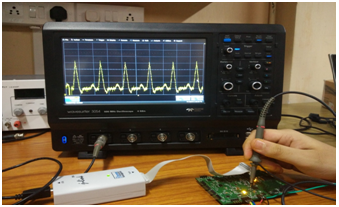 Image Caption:ECG monitoring study at Lab. The current approach towards monitoring of cardiac rhythm over an extended period, requires implantable devices or external devices used under special care. These devices either display rhythms that have been pre-defined by the user or are activated by patient at the onset of symptoms. The lack of monitoring of continuous Electrocardiogram (ECG) signal may lead to loss of valuable data on many important ECG variables such as ST segment, cumulative atrial and ventricular arrhythmia burden, heart rate variability, etc. Because of these, many important episodes may go undetected. Proposed is development of an advanced Holter Monitor which is expected to overcome these limitations. Attempts will also be made to make it function like a remote cardiac monitor by wirelessly transmitting its data for use in telemetry. The early work done by the investigating team members, comprising of MedTech experts show promise of development of an affordable, useful solution.